I love it when I find myself reviewing another Laura Florand winner. I can't believe it's been exactly three years since I initially fell in love with her Amour et Chocolat series, but I have no trouble at all recalling the pure pleasure I took in devouring each successive book about egomaniacal, yet devastatingly charming chocolatiers and patissiers and the strong-willed, wonderfully intelligent women whose misfortune/fortune it was to make and keep their acquaintance. 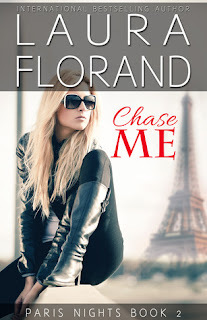 Chase Me is the second book in Florand's Paris Nights series, though they don't necessarily have to be read in order. This series is set in Paris (my favorite of Florand's settings). And while it contains all the wit and charm and emotion of her other works, it also incorporates just the perfect touch of classic Hollywood screwball romantic comedy. It turns out to be the perfect recipe. Violette Lenoir is violently less than thrilled to find an after-hours intruder in the pristine kitchen of her top restaurant Au-dessus. With the American president rumored to be eating at her restaurant within the next few days, the press breathing down her neck, and a lifetime of battling against the rampant machismo of the Paris chef scene under her belt, she does not hesitate to throw a knife or three at Chase Smith's head first and ask questions second. The fact that the unwanted "private security" specialist promptly proposes does nothing to mitigate Violette's rage, no matter how thick he lays on the Texas charm. The problem is that after their battle of wits and weapons, he refuses to listen to Vi and go away. Worse, he appears to genuinely believe himself in love with her. But what truly enrages her, he refuses to tell her what in the world it is he does, why he was in her kitchen in the first place, and why the health inspectors inexplicably shut down her restaurant on a trumped up charge immediately after his unexpected arrival. But somewhere amid his intermittent disappearances and reappearances in her life, Vi is bound and determined to extract and answer to each and every question. Violette Lenoir sighed heavily. "Are you some kind of manifestation of my worst nightmare?" "Hey." That hurt. "You're straight out of my dreams." "You know I crush a hundred men just like you on a daily basis?" Okay, not that he wanted to destroy her self-confidence or anything, but . . . seriously? "I'm pretty sure you don't, honey. Just because they pretend to be me in video games doesn't mean they're actually like me." Just for a second, a flicker of genuine caution showed in her eyes, and her left hand scooped up another throwing knife. Aww, and they'd been getting along so well. He backpedaled. "But don't worry, sweetheart. I may not be crushable, but you're safe with me." "You're not. Safe with me." He sighed with delight. "I know." "So this Quentin . . . what's his last name? Where does he live?" "I took care of him," she said dryly. That was the point, right? She took care of all problems cocky males presented her with. That was how she could stay chef. Yeah, it would be nice if it was all about the food, the way she'd imagined as a kid, but she'd learned long before she finished her first apprenticeship that it was mostly about surviving in a world of sexist assholes. "Stabbed him?" her burglar asked hopefully. "I brought one of the pallets of milk down on his head when he pushed me back against the shelves. Mild concussion." He weighed that a moment. "Much of a struggle before you managed to bring the milk down on his head?" Maybe. She lifted her chin at him and braced her feet. Even if there was a struggle, I still won. "Yeah, you know what? I think I'll still pay him a little visit. Don't worry, I can find his address on my own." "I don't need a hero," she said dryly. He raised his eyebrows. "How do you know? It sounds like you've never had one." These characters are epically magnetic. Lastly, I wanted to touch on the key placement of this novel in the aftermath of the Paris attacks. It plays a visceral role in the lives of all of the characters, both inherently in Chase's career as a counterterrorist operative, and much more profoundly in the fierce spirit of Vi, her friends, her family, and the people of Paris. It was lovingly and thoughtfully written and added a beautiful element of gravitas to this fizzy, heartfelt novel. Chase Me earned an instant spot on my best of the year list, no question. Ivy Book Bindings - "Chase Me is hilarious, un-put-down-able and just so much fun! " SBTB - "I think it’s one of her best books to date." Smexy Books - "If you like great banter, this is a must read." Straight Shootin' Book Reviews - "I love seeing a strong female heroine who can stand up for herself and Violette definitely fits that description."